Happy 2014 Everyone! Here´s hoping this will be the best year ever! Thanks to my Cricut, I was able to make the 2014 numbers for the table. 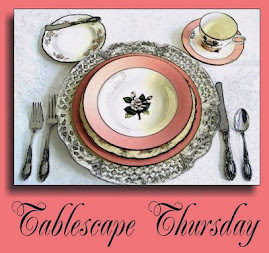 Sorry - just got around to looking at all the lovely tablescapes for NY's. This is beautiful! The sparkle is festive and I love that paper runner too. Kudos for starting the NY off with such a fun table.